If you think about how your clothes make you look, do you think about how your food makes you look? I don't mean how it looks on you, as in, whether or not it makes you trim or curvy. I mean, how it looks as you carry it, hold it, eat it. Is there food you want to be seen eating? Is there food you only eat when alone and in private? 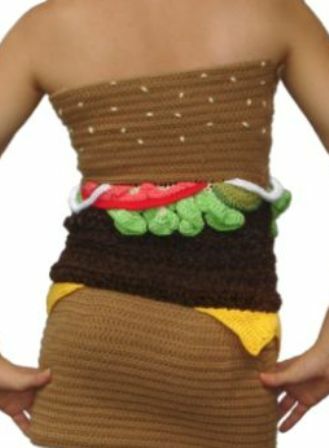 Is there a food fashion? What do people want to be seen eating? I notice that my community college students, especially the younger ones, carry energy drinks to class with them. Although I want to tell them not to drink them, to get some water and fresh fruit instead, I don't. I remember how totally cool I felt sipping mochas at the one coffee shop in my small college town. To this day I remember a girl in my poetry class who brought milky-toned coffee to class in a handmade ceramic mug, and once in a glass jar. She'd hold it in front of her with both hands during class. Sipping occassionally, she looked so sophisticated, so much like a commercial for coffee or a writing retreat. I copied her every chance I got, but the coffee always sloshed out of the open mug, and it burned my hands in the glass jar. How much do you notice what other people eat? How much do you think about the look of the food you eat in public? Are there things you'd never bring to the office for lunch?